What Does “Distinctively Christian” Mean? Classical School of Wichita offers a wonderful variety of part-time classes for home school students in grades 7-12. 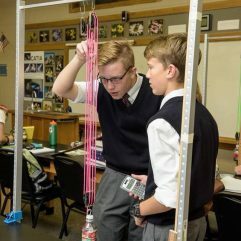 Our upper school faculty love the Lord, their subjects and especially their students. Part-time students are invited to participate in all student life activities. Students who take at least five classes* are eligible to participate in the sports offered at CSW; they also may participate in other KSHSAA activities and competitions. Call today to schedule a shadow day or tour of our campus, classes and state-of-the-art science lab. We’d love to discuss how your home school student could excel as a part-time student at CSW! *In addition to courses offered at CSW, some courses at approved post-secondary institutions may apply toward KSHSAA participation requirements. To discuss eligibility, please contact our office at 316-773-9279. Art (7th-8th) 5-days/week one semester only; $500. Choir (7th-12th) 2 days/week; $275. Drama (7th-8th) 4- or 5-days/week one semester only; $500. Drama (9th-12th) 3 days/week; $300. Engineering (9th-12th); $300. 3 days/week. Physical Education; $300. 3 days/week.